The Kansas State Wildcats were down to their final out on Saturday when they rallied to even the score 2-2 in the top of the ninth inning, forcing extra innings. The Wildcats would go on to score four runs in the top of the tenth and close the door on Oregon State 6-2 to claim game one of the Corvallis Super Regional. Oregon was cruising along for eight innings, hanging onto a 2-1 lead thanks to a stout pitching performance by staff ace Matt Boyd. Boyd went seven strong innings, surrendering just one run on five hits while striking out three and walking two before handing off the game to the bullpen. With Jace Fry on the mound for Oregon State in the ninth, Ross Kivett would keep the Wildcats alive with a two-out double to right center, advancing to third base on the play. Tanner Witt would follow with a single to center, scoring Fry and evening the score at two runs apiece. 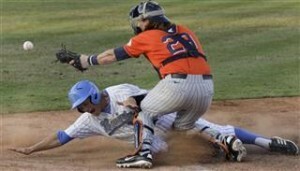 After the Beavers failed to score in the bottom of the ninth, the Wildcats took advantage in the top of the tenth. Kansas State would attack with RBI singles by Jon Davis, Mitch Meyer, and Tanner Witt (whose single scored two). Jake Matthys closed out the game in the bottom of the tenth, cementing a 6-2 victory for the Wildcats. Kansas State now sits on the brink of advancing to their first College World Series with a win on Sunday. Oregon State looks to keep their College World Series hopes alive on Sunday, as both teams are set to play game two at 10:00 PM at Goss Stadium.